I painted this little miss the other night and have to admit, I’m quite smitten with her. 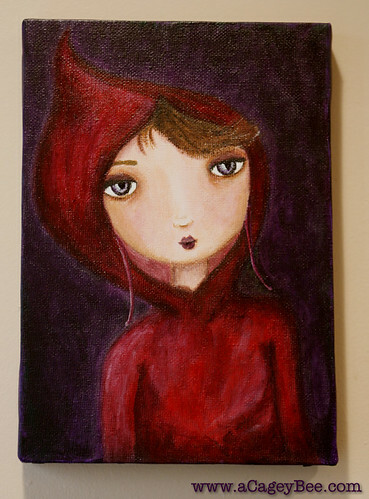 My original sketch was just a girl in hooded jacket, more along the lines of the traditional Red (or someone who shops at Anthropologie *swoon*). As the painting developed, the gal had a distinctively more modern look to her and the hooded coat became the more current dress of pretty much EVERYONE these days – the ubiquitous hoodie. Despite straying from my original sketch, I’m happy with how she turned out. I just love when paintings take on a life of their own.